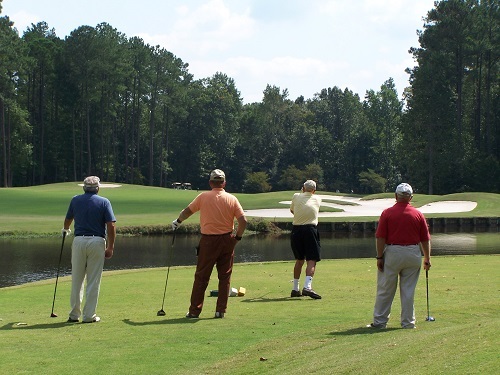 The Cypress Landing Golf Club Men’s Golf Association (MGA) is all about golf and the many opportunities to play, enjoy, and compete in this wonderful game. The MGA is an organization which supports fellowship and provides a comprehensive golf program in cooperation with the Club Professional. The MGA is open to all males 21 years or older and a member in good standing with full club privileges at Cypress Landing Golf Club (CLGC). The current MGA has over 100 members. The MGA has 18 hole and 9 hole groups. A player may opt to play the white or gold tees and remain on those tees for the year. There is a nine hole walking group within the MGA. The MGA sponsors golf tournaments and weekly Wednesday Play days for the benefit of MGA membership. From April through October, members play every Wednesday a variety of games formatted on fun and competition. The MGA hosts the following special events: the annual Lamborghini tournament, The Ryder Cup and the MGA Shoot-out. If you are a new to Cypress Landing Golf, please be sure to join the MGA. Simply let someone in the Pro Shop or an MGA member know you would like to become a member. The membership cost of $30 supports MGA activities and prize funds. Membership applications are in the Club House. See you on the course.